The sound of chime of bells made us rush to the small room where the grandfather would be waking up god early in the morning,with a lighted diya in one hand and a small bell in other. These are the earliest memories I have, of the brush with divine ! He would recite the prayer and follow up with a Aarti while offering the Jalebis and Kachori to the Lord. The routine would follow day after day while we children scrambled around him to ensure that we get the chance to distribute the 'prasad' to rest of the family members who had missed the morning ritual. 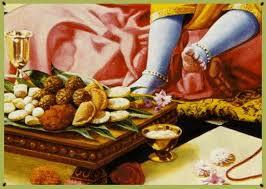 Who does not love the delicious Prasad, or the offering to the god? In India there is hardly a temple where the god is not made an offering of 'Prasad' invariably as a meal at least three times a day. It is later distributed among the devotees! The more affluent temples have this at even more intervals of time ranging from six to eight offerings in the entire day . There is a strong relationship between the spiritual bonding with the God and food in almost every temple not only of Hindus but other religions like Sikh, Buddhism and many others too. In early days the lure of Prasad was one of the reasons to visit the ‘Hanuman Mandir’ located in the heart of Delhi on Tuesdays! As I started to travel around, I got to see some of the most simple to exotic temples across the country and even on trips abroad. The aroma of the Prasad ,incense and flowers would draw me to the temple . The ‘laddus’ offered to Lord Balaji at Tirupati ,the various delicacies to Lord Jagannath and Krishna at temples in Puri, Mathura nd Vrindavan are just fabulous with an unmatched taste. These have also long shelf and can be conveniently carried. The same is true of ‘langars’ served in gurudwaras all across the country. The Golden temple at Amritsar to many lesser known ones serve millions across the country. Even Steve Jobs has mentioned about eating at a Hare Krishna temple located seven miles away every Sunday in his early years of life, before the ‘Apple ‘ days. He was drawn to India in search of spirituality through this early bond. The temples that are located in Himalayas offer one of the best ‘prasad ‘ to devotees ranging from ‘rajma-chawal’ at Katra on way to Vaishno devi,’chana cooked in natural springs in a gurudwara at Manikaran near Manali, to the humble prasad of ‘tulsi leaves ‘ at Kedarnath to name just a few.Likewise at ISKON temples acrosss the globe one can enjoy lovely food and snacks prepared hygenically and without use of onions and garlic. The list could be endless. Even now, the love to taste the offerings made to the lord after a visit to temple stays as in early childhood years.The best thing about the food offerings is that it is a great equalizer where regardless of the social standing one and all are served together, though unfortunately this is not followed in the spirit in many places. What a lovely description of Prasad. Absolutely...prasad from temples is indeed manna from heaven..in the Vishnu temples, even the Tirth tastes so divine with the aromatic camphor..
That is the beauty of the prsad:)Thanks a lot for reading! My mouth is watering now after reading all your descriptions of the delightfully tasty Prasad! Most of the temples in Karnataka serve lunch which are hygienically prepared. Yes, nothing can beat Thirupati laddoo. Likewise Vaishnavite temples like Srirangam, Gunaseelam etc. are famous for their unique tamarind rice and sweet pongal. Interesting subject for a post, Rahul...took me to my childhood days when we didn't hesitate to eat anywhere! Thanks a lot Sandhya! I know what you mean as I too have enjoyed the tamarind rice, curd rice, lemon rice and many more unique preparations in temples in South India! Prasad is sacred for us.I too used to haunt Hanuman Mandir in Connaught Place very often and especially before the result were to be announced ;).Then there is a small Kali Bari near by on what used to be Baird Road then.When I visited it recently I was astonished to see a young man offer alcohol as prasad.Any idea how common that is? Thanks Induji for add on to my blog! There is another temple near Purana Qila called Bhairav Mandriva where too alcohol is offered to the God by devotees! You have been to so many places and temples ! So lucky! Nice to see you back Ashok! And not to forget the fabled langars at Golden temple and bhog served during Durga Puja. God indeed is a gastronome. Tuesday was my favorite day. We got prasad from everyone in our colony. This post brings back many memories. As a travel i look for ISKCON temples everywhere I go, it serves as a perfect place to eat food on budget.